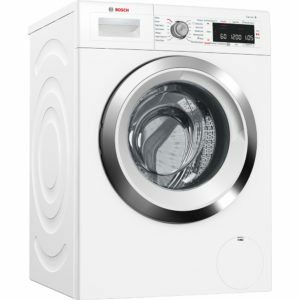 Your washing machine is probably the appliance you most rely on in your home and it's important that you get the right machine to suit your requirements. 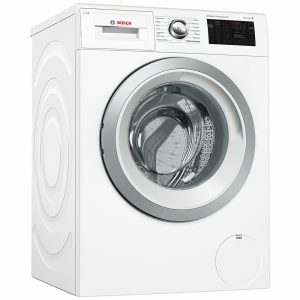 This Bosch i-DOS washer has an impressive 9kg capacity and a 1400rpm spin speed and is finished in white. The clever i-DOS system from Bosch determines how much detergent to use based on how dirty your load is and how hard the water is. Just add detergent once for about 20 washes and let i-DOS dose each wash. Never too little, never too much - you'll soon discover precision dosing guarantees perfectly clean laundry every single load. Bosch's Reload function allows you to add or remove clothing of any size to your washes. Simply pause the cycle and your machine will automatically adjust the water level to enable you to open the door. Reload items and restart! Perfect for that forgotten sock. This Bosch washing machine has an impressive 9kg capacity and a 1400rpm spin speed. With an EcoSilence Drive this model is extremely energy efficient and quiet. This model has an AutoStain feature which removes 16 of the most common stains. Perfect for those muddy football kits and wine stained table cloths. With Bosch's Vario Perfect technology, you take control of the wash, choosing whether you reduce cycle times or energy costs. Finally, Bosch's Reload function allows you to add or remove clothing of any size to your washes. Simply pause the cycle and your machine will automatically adjust the water level to enable you to open the door. Reload items and restart! Perfect for that forgotten sock. With so many options you will never need to look any further for laundry!